The last time you went off in search of a replacement light bulb, were you left paralyzed by the proliferation of new types of bulbs in the lighting aisle? Here, we clear away the confusion with this helpful breakdown of the different varieties on the market and their best uses. It’s not your imagination: The light bulb section in your local hardware store has grown. Bulbs of every type, color, and shape line the shelves in a wide—and confusing—array of options, making it hard to find the right bulb for your needs. But once you understand bulb basics, choosing the right replacement bulb for your lamp or fixture can be a snap. We’ve put together what you need to know about the many different types of light bulbs on the market these days so the next time you’re face with a burned-out bulb, you’ll be prepared. Before you head out in search of a new bulb, get a grasp on terminology manufacturers use to measure the input and output of certain types of light bulbs. Watts indicate the amount of energy the bulb will use. Bulbs with lower wattage will use less electricity, and can therefore help keep the electricity bill down. Here, the age-old mantra holds true: Less is more. Typically, a standard 100-watt incandescent bulb emits approximately 1600 lumens. Newer types of light bulbs, however, require less power and emit just as much light. 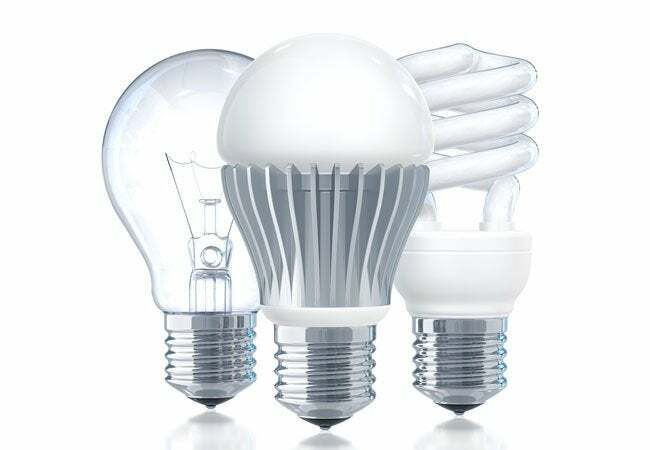 Standard incandescent bulbs—known for being energy hogs—have experienced an energy-efficiency upgrade that began, for bulbs sold in California, in 2011 and became nationwide in 2012 as part of the Energy Independence and Security Act of 2007. Common household light bulbs, which traditionally used between 40 and 100 watts before 2011, now use at least 27 percent less energy than they did back in the day while still producing comparable lumens. That means that you’re less likely to find 100-watt bulbs on shelves today, which stopped being manufactured in 2012, and are more likely to be greeted with options of 30, 40, and 50 watts. Incandescent bulbs do not contain mercury, and they last an average of one year before needing to be replaced. Best For: Use with dimmable light fixtures, vanity lighting (because incandescent light flatters skin), and low-voltage lighting. 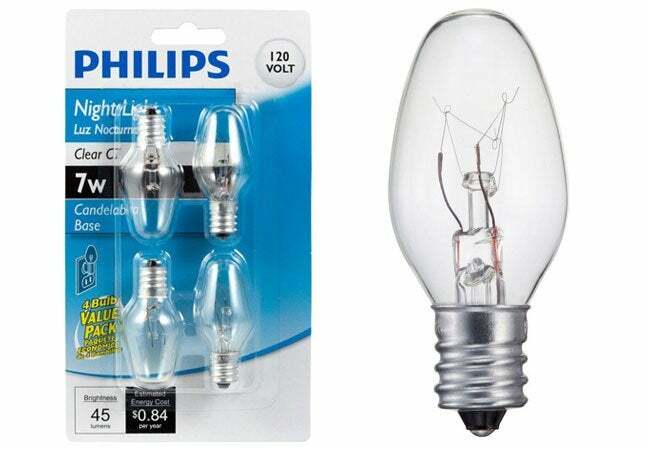 Try the candelabra-base GE 60-Watt Bulb in your dimmable dining room chandelier ($5.97 for a 4-pack at Home Depot), or buy the Philips 7-Watt C7 Replacement Bulb for your toddler’s night-light ($3.97 for a 4-pack at Home Depot). Fluorescent tube bulbs have been around for years. You’re no doubt well acquainted with the long, cylindrical glass tubes you see in overhead lights in department stores, but you can also find circular and U-shaped fluorescent tubes to fit specialty fixtures. This particular type of light bulb uses less energy than incandescent bulbs, but it contains mercury vapor and a phosphor coating that converts UV light to visible light when turned on. Because these bulbs contain mercury, many communities have regulations for their disposal. Best For: Bright lighting needs in your workshop. 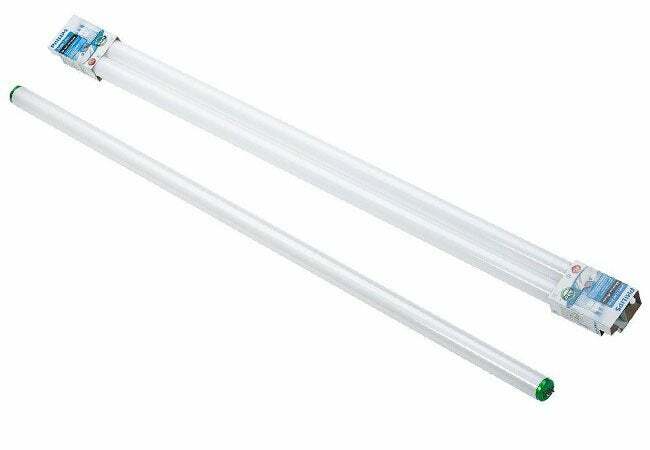 We like the Philips T12 40-Watt Daylight Deluxe Linear Fluorescent Tube ($9.97 for a 2-pack at Home Depot); while it draws only 40 watts, it produces 2,325 lumens of bright light. Compact fluorescent (CFL) bulbs—easily identified by their hallmark curlicue design—use a fraction of the wattage incandescent bulbs use. While good for reading and project work, the light they emit is relatively harsh and undesirable in vanity lighting, where they can add 10 years to your appearance. Like fluorescent tubes, CFLs contain mercury, so broken bulbs should be disposed of according to the EPA’s suggestions for cleanup. Note: Most CFLs don’t work with dimmer switches and aren’t particularly well suited for light fixtures you switch on and off frequently, as this habit can shorten their useful life. Best For: Overhead lights, lamps, and task lights. 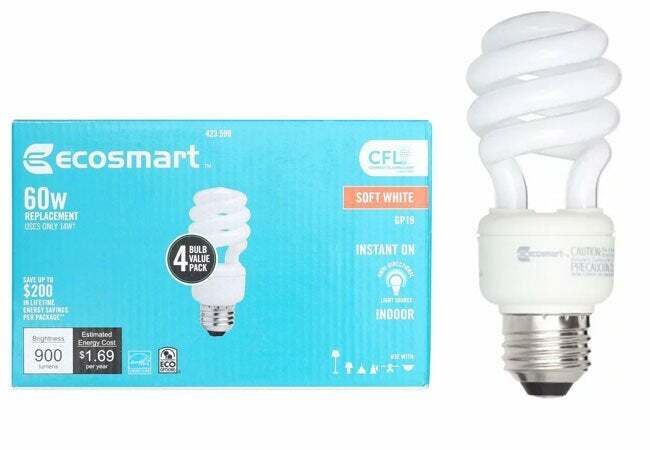 A smart choice for replacing the bulb in your reading lamp is the EcoSmart Soft White Spiral CFL ($5.97 for a 4-pack at Home Depot); equivalent to a 60-watt incandescent bulb, it emits 900 lumens of light. In places where you need more illumination, such as for task lighting in the kitchen, try the Philips Daylight Deluxe T2 Twister CFL ($12.95 for a 4-pack at Home Depot), which offers the same amount of light as a 100-watt incandescent bulb. Light emitting diode (LED) bulbs are currently the most energy efficient of all types of light bulbs. Though they were costly when they first hit the market, prices have dropped significantly since then. With lifespans that exceed those of most other bulbs and options that encompass a variety of colors as well as white, these bulbs offer the best bang for your buck. Early LED bulbs offered only directional lighting, but with recent advances, manufacturers are now offering LED bulbs that emit whole-room diffused lighting. Best For: Just about anywhere you previously used incandescent bulbs. 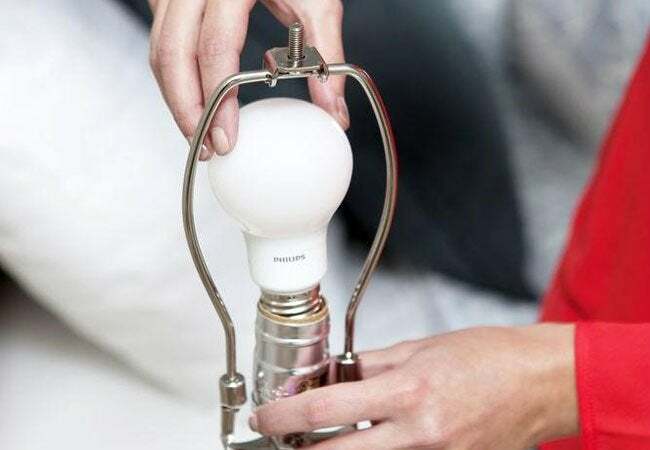 To replace the bulbs in your overhead lights, wall sconces, or table lamps, try Philips Daylight A19 LED Bulbs ($8.97 for a 4-pack at Home Depot) or the Philips Soft-White B11 Candelabra Bulb ($6.97 for a 3-pack at Home Depot). Halogen bulbs use 25 to 80 percent less energy than incandescent bulbs, but still use more than CFLs and LEDs. The white light they emit brings out vibrant tones in furnishings and decor. Halogen bulbs come the closest to natural daylight, but as they get extremely hot, be sure not to use them in any lamp or fixture that small children can reach. A variation on halogen, xenon bulbs cast the same clear white light yet remain cooler to the touch than standard halogen bulbs, making xenon safer for use in table lamps. Best For: Exterior floodlights, hanging pendant lights, and accent lighting. 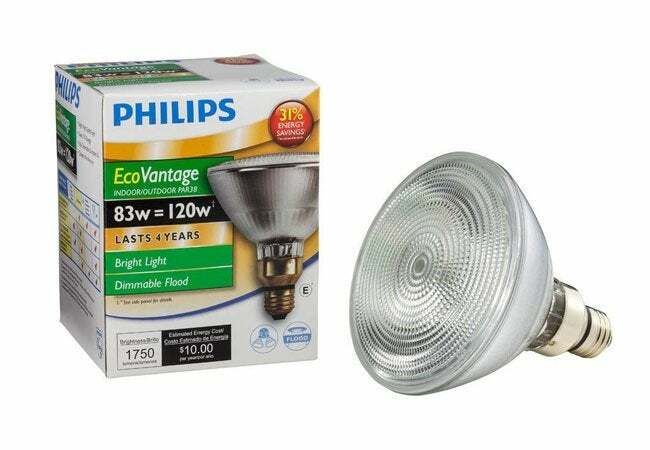 If you’re looking for an energy-efficient outdoor bulb, try Philips EcoVantage Halogen PAR38 Dimmable Floodlight ($9.97 per bulb at Home Depot). With 1,750 lumens, it will light up walkways and provide a measure of security. Are you in need of a replacement bulb for your bi-pin socket track lighting? Feit Electric’s Xenon 20-Watt Halogen G8 Bulb ($7.95 for a 2-pack at Home Depot) fits the G8-shaped bi-pin base sockets found in popular track, display, and task lights. Strictly in the realm of “specialty bulbs,” Wi-Fi-capable bulbs fit ordinary lamps and fixtures but give you the ability to either program the bulbs to turn on at preset times, or control them remotely from your smartphone or tablet. Read the fine print before you buy one that doesn’t work with your mobile device; some bulbs are strictly Apple- or Android-compatible. Best For: Remote operation of overhead lights or lamps that you typically set to stay on before you leave for vacation. If you own an iPhone or iPod, check out the Philips Soft White A19 Hue Connected Home LED ($14.97 per bulb at Home Depot), which connects to your home’s Wi-Fi signal so you can operate the light remotely via an app. 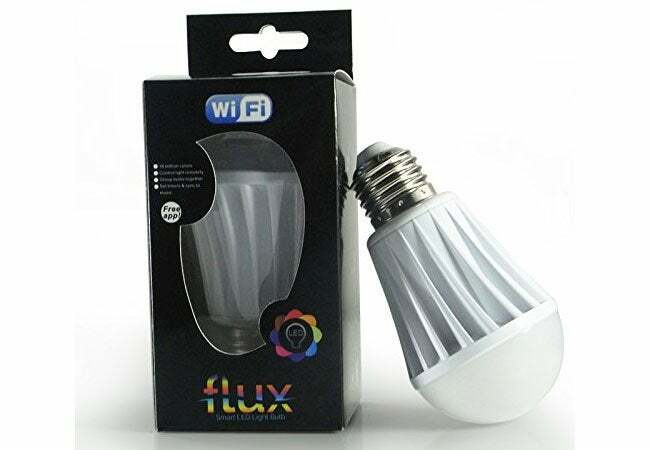 Alternatively, the Flux Wi-Fi Smart LED Light Bulb ($35 per bulb on Amazon) is a bit pricier but promises more control over brightness and color; for both Apple and Android products.